An essential piece of information you need to know before you buy a ring binder is the sheet size. But what does that mean and what are the options? It may surprise you to learn that many users don't know how to respond when we ask them what sheet size they need to bind, or will respond instead with the stack thickness or page count. Sometimes they will also give you the binder dimensions. Sheet size, however, is actually the dimensions of the paper itself, i.e. the width and the height of the paper that will be inserted into your binder. This spec is important because the binder itself will need to be large enough to bind those pages, plus the possible addition of an index tab extension. 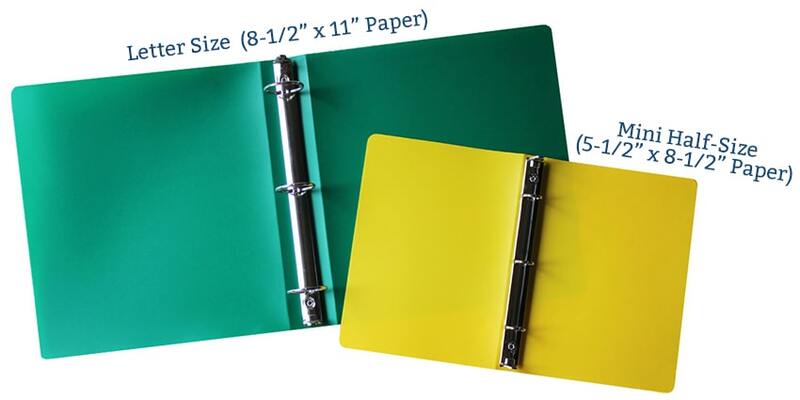 The page size is the largest paper sheet that will be in your binder. The most popular sheet size in the United States, often considered the standard, is called "letter size" and measures 8 ½ inches wide and 11 inches high. When index tabs are added, this sheet size most often becomes "letter size with index tabs". Index tabs usually add 1/2 inch to the page width, making them 9 inches wide overall. But as long as you match up the terminology of a "letter size" sheet with a "letter size ring binder" you should be safe, as most manufacturers always make their binders large enough for this tab allowance. Letter size binders in the US will almost always be 3-ring. The standard 3-ring spacing for these binders matches the spacing of common hole punchers, making them very convenient to punch for. They hold your pages in portrait format and bind on the long 11" edge. But sometimes top-bind binders may have 2-rings instead of 3. These binders will hold your pages in landscape form, binding on the short 8 ½" edge. From time to time you can find these binders, but often they are considered custom or made-to-order. Growing more and more in popularity is a half-letter or "half size" sheet. These are exactly what they sound like; a letter size sheet cut in half, creating an 8 ½" x 5 ½" page. Mini binders like this also have 3-rings with a ring spacing of 2 ¾" between the rings. To punch paper for half pages, you need an adjustable hole puncher that lets you set the hole punch distances. A legal size paper measures 8 ½" wide and 14" long, so is quite a bit taller that letter size. As the name would imply, this page size is almost exclusively used in the legal industry. Most often they have 3-rings, but sometimes they can have a 4-ring mechanism installed. For either of these you may need a special hole puncher with adjustable hole spacing and the option to add more hole punch dies to it, or potentially a paper drill machine. Memo sheet size is most often used in planners. Sometimes called mini binders, but not to be confused with half size, memo size ring binders will always have 6-rings instead of 3. They are also a different sheet size, actually measuring just 6" high and 4" wide. The 6 rings are grouped into two sets of three with a spacing of 3/4", 3/4", 1 ½", 3/4", 3/4" between the rings. Less common the US, but still requested, is an A4 sheet size binder. This A4 terminilogy is usually used for binders elsewhere in the world, including Europe, Asia, and more. A4 sheets measure 210mm x 297mm, or about 8.27" x 11.69" (a bit less wide, but a bit taller than a letter page). A4 ring binders are almost always going to be available only with a custom order. Tabloid size sheets are 11" wide and 17" high, and often the largest ring binders made. They are almost exclusively made to-order and considered custom, because they are simply not as popular or common as the other options.